You could go the traditional route for Valentine’s Day with chocolates, flowers, and pricey a dinner. Or, you could celebrate your love at two fun and unique events, happening exclusively at the Foothills Event Center in Grass Valley. Our upcoming events will almost certainly make this a Valentine’s Day to remember! The Foothills offers the perfect setting to celebrate Valentine’s Day. These festivities will help you create the ultimate Valentine’s Day experience for you and your special someone. Keep reading to learn more about our Valentine-themed events coming up next week at the Foothills! Searching for Valentine’s Day gift ideas for that special someone? 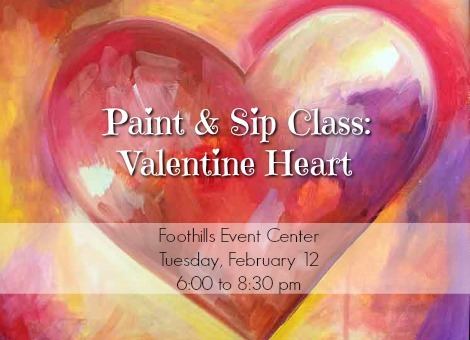 Come Paint With Us is hosting a paint and sip class at the Foothills Event Center, to paint this sweet Valentine’s Heart! We think that this is would be fun to paint with your sweetheart on a date. Or, go to the class with friends and make your honey a charming, handmade Valentine’s Day gift. Just add wine (or beer!) and get ready to have a fun, laid-back evening! You don’t need to have any painting experience to enjoy Tuesday’s paint and sip class. Your instructor is going to give you step-by-step guidance so that you can easily create this fun, vibrant heart. Come Paint With Us provides everything you’ll need to paint this heart: an apron, easel, brushes, a 16×20″ canvas, paint, and easy-to-follow directions. Register here to reserve your spot in this paint and sip class! After you finish dinner on Valentine’s Day, come to the Foothills to dance the night away with your sweetheart! We invite you to enjoy a show-stopping night of soul and R&B music from Love Train, a six-piece band. They’re putting on a special Valentine’s Day show here at the Foothills Event Center! The band covers 1960’s soul hits from artists such as Otis Redding, Aretha Franklin, and Wilson Pickett. Wine, beer, and delicious desserts will be available to purchase from the Foothills bar. This is a funky concert that you won’t want to miss! Get ready to groove to hits like “(Sittin’ On) The Dock of the Bay,” “When a Man Loves a Woman, and “In the Midnight Hour.” Doors will open at 6:30 and the show begins at 7:30. Tickets are $15 each, and $25 for a couple.